The Draupadi Dream Trust held an international seminar to highlight the character of Draupadi and research about her land, Panchala. 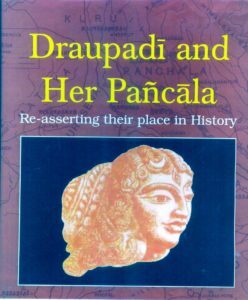 This book, edited by the trust’s chairperson Neera Misra, who is from Draupadi’s birthplace Kampilya, and Air Vice-Marshal Rajesh Lal collects 11 papers on Draupadi and 12 on various facets of Panchala in Hindi and English. What is of importance is material drawn from the rare “Kampilya Mahatmya” where Draupadi is an avatar of Parvati. There are a large number of colour plates and illustrations that make this a valuable repository of data. Hiltebeitel’s paper on Draupadi is a valuable contribution resolving the controversy over whether her laughter spurred Duryodhana’s vengeance. Examining the recensions of the Mahabharata, he shows that the initial account only has Bhima, Arjuna and the twins laughing at Duryodhana’s discomfiture in the palace of illusions. It is Duryodhana who, while complaining to Dhritarashtra, adds Draupadi and Krishna as also taunting him to get him to join in the conspiracy of the dice game. It is Villi’s Tamil Mahabharata that has Panchali clapping her hands and laughing. The crowning insult of “Andhey ka betaa andhaa” (the blind man’s son is blind) was invented by Dharmavir Bharati in his play, “Andhaa Yug” and popularised by the Chopra TV serial. Possibly the most rewarding research in this book is by Indrajit Bandyopadhyay who plumbs the depths of what is meant when the term “Shyaamaa” is applied to Draupadi. He ranges far and wide across the epics and the Vedas, including Anandavardhana’s concept of dhvani. He brings out its multiple meanings and resonances to show how Krishnaa-Draupadi stands at the centre of the Krishnas who mould the epic narrative: Krishna-Dvaipayana-Vyasa, Vasudeva-Krishna, Arjuna-Krishna. However, while doing so his enthusiasm leads to convoluted interpretations of wheels-within-wheels not all of which are easy to follow. The organisers are to be complimented for bringing together eminent novelists to speak on Draupadi. Pratibha Ray, author of Yajnaseni, the autobiographical testament of Draupadi, for which she became the only woman to be awarded the Moorti Devi Puraskar by Bharatiya Jnanpith, provides sensitive insights into her interpretation. Sujata Chaturvedi summarises the insights of Chitra Chaturvedi in her Hindi novel Mahabharati depicting Draupadi as a fiery upholder of women’s rights and a profound bhakta of Krishna. Unfortunately, this excellent novel has not been translated into English. Narendra Kohli, renowned for his recreation of the epic in Maha Samar (Hindi, 8 volumes), stresses the need to go back to the original text for the proper perspective. He, too, notes that Duryodhana lied to his father about Draupadi taunting him and points out that she never demanded Duhshasana’s blood to wash her hair (as Neera Misra claims in her paper), nor desired Karna. P. K. Balakrishnan’s And Now Let Me Sleep (summarised in Kavita Sharma’s paper), on the other hand, has her die realising that Karna protected her and her children. Kohli interprets the emergence of Draupadi and Dhrishtadyumna from the sacrificial fire as starting a new life—that of vengeance for their father’s humiliation. He is the only participant to mention the critical role Kunti plays in the Pandavas’ fight for their rights. Haripriya Rangarajan wrongly asserts that Draupadi was known as Parsati after her mother. Drupada’s father was called Prishat, after whom Draupadi was called Parshati. Nor has Hiltebeitel written three volumes on the cult of Draupadi, but only two. Shri is not the epitome of sattvik quality but of rajasic and Draupadi is never depicted in sattvic form in the epic. Why Narhari Achar’s paper on the date of Draupadi’s svayamvara has been included is unclear. He states that astronomical information is non-existent and whatever dates he proposes “are at best guesses.” He bases his calculations on one “Raghavan”, providing no references. The editors have not rectified this omission. Ramola Kumar’s “Draupadi Communicates” that ends the section on Draupadi, rehashes what is very well-known. She does not even attempt a critique of how the TV Mahabharatas and Peter Brook’s film portray Draupadi. It would have been rewarding to read what Mallika Sarabhai and Shaoli Mitra have to say about their experiences of portraying Draupadi on stage. Neera Misra draws twelve lessons from the Kampilya Mahatmya and the epic about what Draupadi signifies. She has the soul-force of Parvati; she is pure, radiant, constant; she converts challenge into opportunity; the stripping shames the men not her; she was the victim of the war, not its cause; she was a dedicated ardhangini; she upheld dignity of labour (serving Virata’s queen); her friendship with Krishna empowers her (the folklore of her binding up his bleeding finger is cited); progressive men believe in gender equality (but how does Krishna saving the Pandavas from being cursed by Durvasa show this? ); she balanced her husbands equally; she was compassionate, as in sparing Ashvatthama; finally, she is a role model to women today in overcoming challenges to stand tall. The section on Panchala is by a host of archaeologists, historians and numismatic experts led by Dr B.B. Lal who excavated Hastinapura in 1951-52 finding a Painted Grey Ware settlement of around 800 BCE that had been destroyed by flood in the Ganga, as the Puranas state. King Nichakshu relocated to Kaushambi, where degenerated PGW has been found. On an ad hoc estimate, Lal puts the Kurukshetra War at 900 BCE. However, he makes the usual mistake of stating that the epic originally consisted of 8,800 verses, whereas that is the number of riddling slokas mentioned by Sauti. Ahichchhatra, Kampilya, Kanauj, Atranjikhera and Sankisha have been excavated turning up ochre coloured pottery, black-and-red ware, black slipped ware and painted grey ware with as many as 46 combinations of line and dotted decorations. Dr B.R. Mani suggests that the Rig Veda’s Battle of Ten Kings between five Panchala clans and Sudasa occurring on the Ravi led to a movement eastwards to Panchala by the Krivis who came to be known as Panchals. Bhuvan Vikram presents a detailed analysis of artefacts found in Ahichchhatra along with two large ziggurats which might be temples. It is regrettable that since they were excavated in the 1940s no further investigation has been done. O.P.L. Srivastava studies a coin of Damagupta carrying three Panchala symbols which are unidentified. Panchala was famous for its pure Vedic pronunciation, its resident Galava having developed different styles of recitation. A.K.Sinha’s paper shows it was the seat of materialistic as well as spiritual Upanishadic philosophy expounded by great intellects like Yajnavalkya, Pravahana Jaivali, Pratardan, Gargyayana and Uddalaka (c.1000-700 BCE). The original Kamasutra was written by Babhravya of Panchala. Panchala, one of the 16 maha-janapadas, was swallowed up by Magadha’s Nandas and Mauryas. In the pre-Kushana (150 BCE-150 CE) and post-Kushana phases till 350 CE, 22 kings ruled Panchala as copper coins reveal. Thereafter, it came under Gupta rule, followed by Harsha and Gurjar Pratiharas till the end of the 10th century. Ahichchatra is where Parshvanath attained kaivalya. Sankisha has Ashoka’s elephant capital where Buddha descended to earth from heaven. Recently T.P. Mahadevan has shown that in the 5th century CE a group of Purvashikha Brahmins moved from Panchala to South India carrying the northern recension of the Mahabharata and moved to Kerala whence the recension in Malayali script emerged. Another group, the Aparashikhas, followed them during the Chola period, creating the recension in Grantha and Telegu scripts. Neera Misra presents a detailed account of Kampilya including the excavations by an Italian team (1997, 1999) that revealed that the plans for the Drupada Kila and Dholavira coincide remarkably. The Kila was dated as post-Mauryan with Kushana restoration. It was deserted around 1st century CE as the Ganga shifted. Further excavation is needed to explore the PGW and NBW settlements that have been found. The justification for this has been established by IIT Kanpur’s GPS survey. The state of Uttar Pradesh has adopted as its emblem the revolving fish pierced with an arrow which was the test for winning Panchali. The assertion that the Panchala area comprised all of this state does not account for the rival kingdom of Hastinapura and the Yadava oligarchy of Mathura. Nor did Ashvatthama ever rule in Ahichchhattra as Abhay Singh asserts. This is undoubtedly a stimulating volume compiling important research and insights which is somewhat marred by erratic use of diacriticals and printing errors. The editors would do well to take greater care in future enterprises.